Kuratite, named for Dr. Gero Kurat (1938–2009), meteorite researcher and Curator of the Meteorite Collection at the Vienna Natural History Museum, was first recognized as a new mineral by the Commission on New Minerals, Nomenclature and Classification in 2014 from a small meteorite sample. The object was originally thought to be an Indian artifact and it remained on the farm for nearly two decades before speculation arose that it might, in fact, be a meteorite. This unknown mineral phase consisted of very tiny crystals with an average diameter of only about 0.01 mm. The meteorite was determined to be an exceedingly rare achondrite known as an angrite. It is characterized by prominent vesicles which are rarely seen in meteorites. 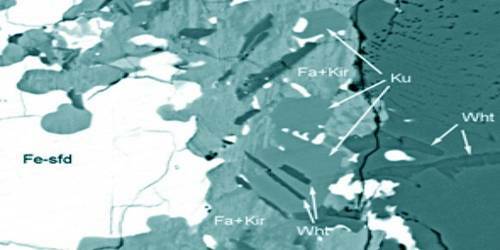 Because of the small size of the available material, it was very difficult to determine all relevant chemical-physical properties, which are required for a mineral phase to be accepted as a new mineral. In multiple-phase pockets, located mainly at olivine-augite triple junctions in an angrite meteorite, probably crystallized from an interstitial melt. Terrestrial occurrences include as a component in tephrite glass, basalt, and phonolite. 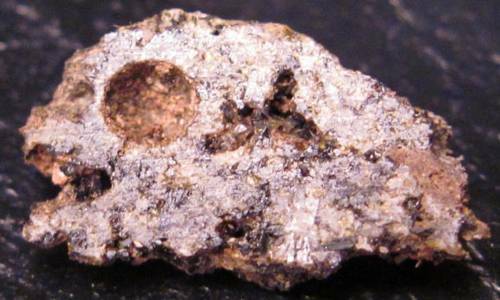 The stony meteorite D’Orbigny is the source of a newly discovered mineral, kuratite. Its name honors Dr. Gero Kurat (1938-2009), a world-renowned meteorite researcher and long-term head of the Mineralogical-Petrographical Department at the Natural History Museum in Vienna, Austria. Association: Whitlockite, an Fe sulfide, ulvöspinel, Ca-rich fayalite, Al-Ti-bearing hedenbergite (meteorite).